Afghanistan is a landlocked country with much of its land covered by the Hindu Kush mountain range which experience harsh winters and deserts in the south that experience hot summers. Afghanistan is a unitary presidential republic with a population of 35.5 million as of 2017. It’s GDP is $20.8 billion. 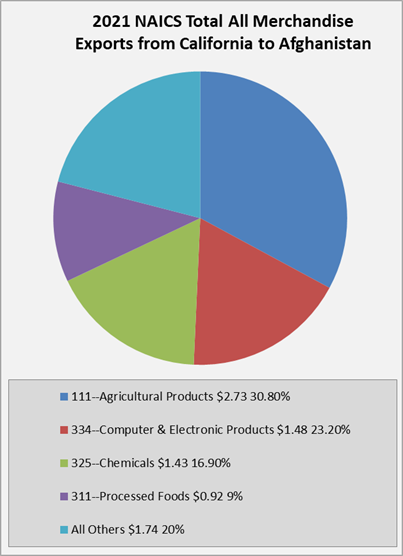 The United States exported $1.23 billion to Afghanistan in 2018. Transportation equipment made up 53.1% of the total and $655 million. This was followed by fabricated metal products at $161 million, non-electrical machinery at $136 million and computer and electronic products at $107 million. The U.S. imported a total of $28.9 million from Afghanistan in 2018. Imports consisted of miscellaneous manufactured commodities at $8.6 million, food manufactures at $7.2 million, textile mills products at $3.86 million, and used merchandise at $3.17 million. (U.S. Department of Commerce). In 2018, California imported $4.4 million worth of products from Afghanistan. Top imports were textile mills products making up 45.3% and $1.98 million of the total followed by food manufactures, which made up 29.8% and $1.3 million. California exported $122.7 million to Afghanistan in 2018. Top exports were computer and electronic products which totaled $7.7 million and 34% of the total followed by agricultural products and food manufactures making up 27.7% and 8%, respectively.(U.S. Department of Commerce).